Scientists: Get Out There and Inspire! This is the story of how one passionate scientist, speaking live in front of an audience, can impact a life. My husband and I went to see the first of four National Geographic Live presentations in Toronto last week. It was a fabulous lecture and seeing photographer Mattias Klum in person reminded me of the last time I saw I live National Geographic presentation. 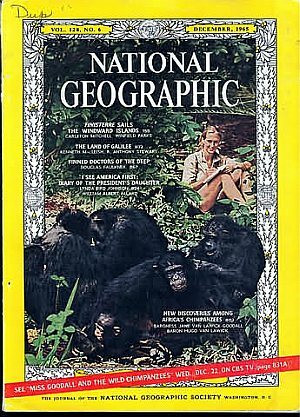 When I was growing up in Maryland, my parents always got season tickets to the National Geographic Film Series in Washington DC. Every Friday night through the winter my parents would dress up, drive into DC to DAR Constitution Hall, and enjoy a film narrated live by a National Geographic sponsored researcher, traveler, journalist or photographer. What this meant for me and my sisters, when we were young, was a babysitter, TV dinners, and being allowed to stay up past our bedtime to watch The Addams Family. But what this meant when we were older was that we each got to choose one lecture to attend with my parents. And oh my, the picking was hard. 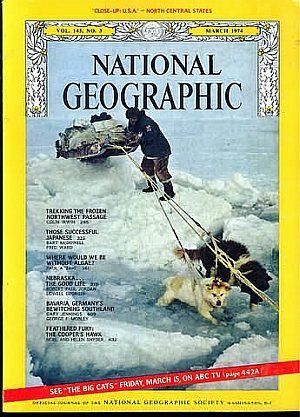 Each page of National Geographic brochure would feature one lecture, with a photo or two, a bio of the lecturer and a summary of what he or she would be talking about. And you couldn’t pick the same one someone else picked. With three sisters and maybe 16 lectures to choose from, making that selection was agonizing. Some were easy to eliminate. I had no interest in Parisian Architecture, Dutch tulip growers, or Chilean woven tapestries. But then there were adventurers and animals! Should I pick Bears of Kodiak Island? Conquering K2? Paddling the Mighty Amazon? The Secret of the Snow Monkey? It was so hard to choose. Of those I attended, two presenters stand out in my mind. One was a man who talked about his travels in Alaska. He was hilariously funny (at least to me) and he gave me my first look at the enormity of glaciers and the breathtaking sight of them calving and crashing into the sea. I held those images in my mind hoping someday to see the glaciers in person. Some 35 years later, this past summer, I finally got to do just that. What that lecture did for me was more than just show me a family of chimpanzees. 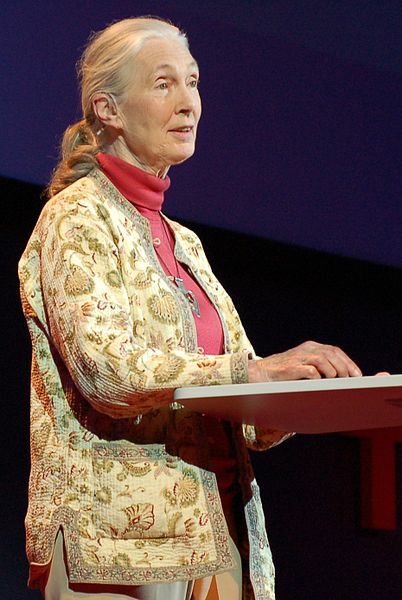 It opened a door to the idea that a person could DO what Jane Goodall was doing. To be sure, I didn’t make that connection at the time. But she never left my mind. Years later, when I was casting around after high school, trying to figure out what I was going to do with my life, Jane came back to me. I knew I wanted to “work with animals”, but as one kindly employer pointed out, that was a pretty nebulous goal. I toyed with the idea of vet school, but it would be generous to say that my grades and SAT scores didn’t quite make the mark. So I joined the ranks of the undecided and signed up for a General Studies degree at a community college. As I reached the end of that and was again thinking about what to do with my life, I found out (thanks Mom!) about a field called “ethology” – the study of animal behavior. Revelation! This is what Jane Goodall was doing! Not just going out into the field and cataloging animals or calculating biomass, but actually recording what they were doing. I wrote away to colleges and ordered catalogs. I quickly learned that nobody gave a degree in ethology. It was a sub-discipline of Zoology. I also learned, to my surprise, that most schools granted a BA in Zoology. Well that would never do. I wanted a Bachelor of Science degree. So more letters and more catalogs (would have given my right arm for the internet back then) and there it was: Colorado State University, BS in Zoology, and a good selection of animal behavior courses. I applied, got in, aced all my animal behavior courses, and got my degree. In the end, for a variety of reasons, I never actually became Jane. But it’s ok. The point is that when I was 14 years old, I sat in front of an actual field researcher and was inspired by her words, her research, her film, and her subjects. And that inspiration has never left me. It drove me to get my degree in Zoology. 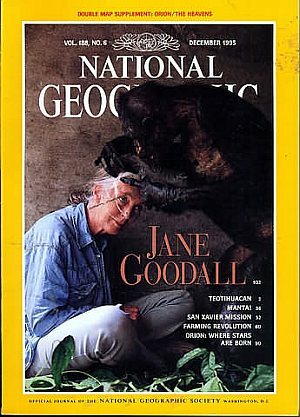 It has driven me to follow Jane Goodall’s career and the works of many other primatologists, zoologists, and scientists. It has driven me to a lifetime of self-study (yay internet!) in natural sciences. It drove me to go on an EarthWatch expedition to Sri Lanka to study macaques. It drove me to start work on a book that relates animal behavior and physiology to humans, both physically and in a looser sense, through literature and art. And it drove me to start this blog. DO NOT underestimate the power of standing in front of an audience and talking passionately about what you do. I don’t mean in a lecture hall filled with biology 101 students many of whom don’t even want to be there. And I don’t mean teaching your subject. No, I mean zealously extolling the joy of the hunt and the fruits of your work in front of high school students, community groups, people at parties, and any attendees anywhere who are interested in hearing you speak. And please, when you do that, answer the unasked question from the shy 14 year-old in your audience: How did you get to do what you do? What was your path? DAR Constitution Hall holds 3702 people. Of those who were there that night in the early 1970’s, I don’t know how many were changed. How many at least made a run at being Jane, like I did. How many actually succeeded. Or for that matter, how many wished they had gone to see “The Plumbing of Ancient Rome” instead. It doesn’t matter. I was changed. I’ve been following you on Twitter for a while, but I didn’t know that you’ve got some ties to the WCDR or the Critical MS group. I’m not part of the Critical MS group myself, but that book you’re working on sounds really interesting, and I’m sure your passion for your work and knowledge will show through in it. Please let me know about your progress on it! Heh, the little bird that told me was you, in the blog post above!